Everyone who follows me on Twitter, reads this blog, or has ever attended one of my presentations knows I love talking about Kate DiCamillo, India Opal Buloni, Rob Horton, Edward Tulane, Despereaux Tilling, Peter Augustus Duchene, Mercy Watson, Francine Poulet, Flora Belle Buckman, and Ulysses. Kate's characters jump off the page and stay with you forever. I've found myself thinking about Raymie Clarke, Beverly Tapinski, and Louisiana Elefante more than I have ever thought about any other characters before. Each distinct character has made me think long and hard about my soul and my heart. 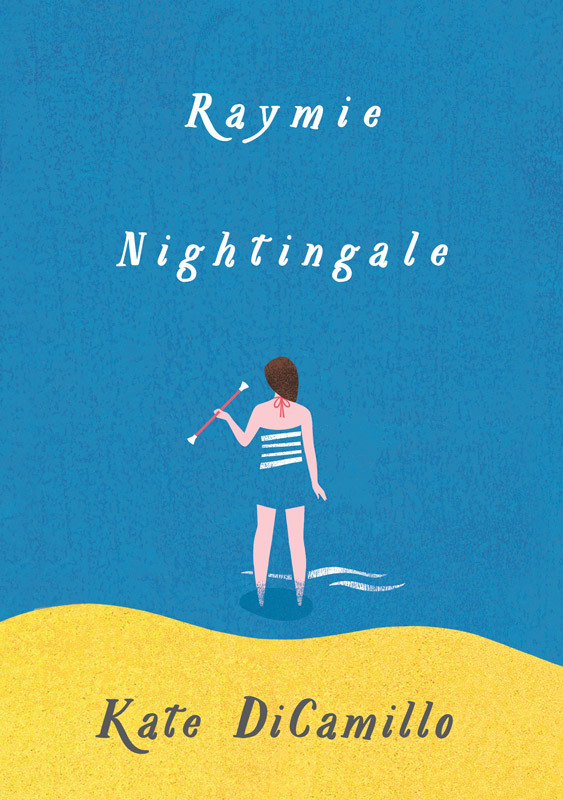 I cannot wait until Raymie Nightingale is in bookshops, libraries, book fairs, and in the hands of young readers. I hope these three girls speak to your heart the way they have spoken to mine. I am beyond honored two-time Newbery Medalist and my friend Kate DiCamillo dropped by to chat with me about Raymie Nightingale, school libraries, and batons. I wrote the words in purple, and the great Kate wrote the words in black. Thank you, Kate! Raymie, Beverly, and Louisiana are each a part of me. I understood myself better after spending time with these characters. I liked myself better, too. The Little Miss Central Florida Tire contest stills makes me laugh out loud to think about. Originally, I thought that the winner would receive a crown made out of a tire. Wheeee. That makes me laugh, too. I think Mr. Staphopoulos and Mr. Option are good kind, men who see Raymie clearly and give her great gifts. A ranchero is somebody you can rely on. Always. Forever. Mrs. Sylvester’s gigantic jar of candy corn is based on an orange water pitcher that I saw in a coffee shop in New Orleans maybe four years ago. The sun was coming in through the coffee shop window and it lit up the pitcher so that it looked like something wondrous from another planet. And I thought: everything ordinary is also beautiful if you look at it long enough and in the right way. School libraries are gateways to the world. Mr. Schu, you should have asked me if I can twirl a baton. Ha ha ha. Of course I can’t twirl a baton. Even though I took lessons I never learned. Look for Raymie Nightingale on April 12, 2016. Kate DiCamillo is a national treasure for those of us who adore children's literature! Thanks for the interview Mr. Schu and thanks to Kate for her books and for letting me know I am not alone in being a baton-twirling failure! Oh, I cannot wait to get my hands on this book. I'm literally counting the days. 48, to be exact. I'm a huge fan of Kate DiCamillo too, Mr. Schu. Because of Winn Dixie remains one of my all-time favorite books, and I just loved Ulysses too. Can't wait to read this one! My daughters loved reading Kate DiCamillo's books, they got me hooked! Now I read them to my classes. I am a huge fan, and I can't wait for this book to come out! Thank you for sharing your stories; you are brilliant! Kate DiCamillo is a treasure! Can't wait to read this book! Love Kate DiCamillo! The book is waiting for me after my day at the Wisconsin Education Association Council representative assembly. I love all of Kate's books. There is joy and melancholy in each, just as our lives are filled with each. Looking forward to reading her latest! Just finished this treasure! Love the 3 Rancheros so much! Thanks for the post, Mr. Schu! 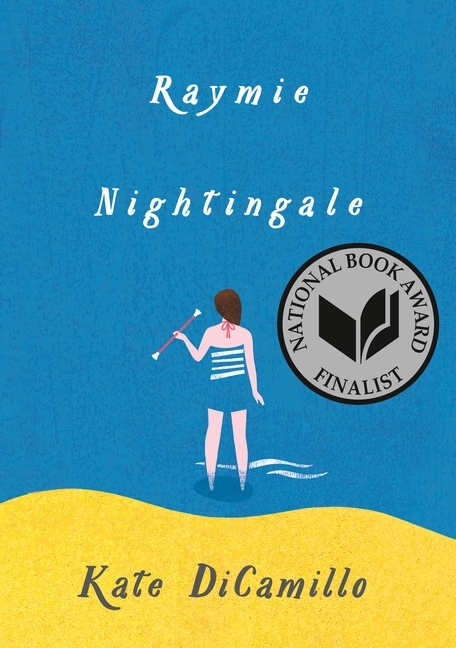 I just finished reading Raymie Nightingale and I loved it SO much!!! It was one of those books where I was almost sad to finish it because I didn't want it to end!!! I think it might be my favorite Kate DiCamillo book so far. I think it will definitely be in the running for the Newbery. Thank you, Scholastic Library Publishing!